IT'S BEEN OVER TEN YEARS SINCE WE HAVE SEEN THEM. NOW, ALY AND AJ MICHALKA ARE FINALLY BACK IN THE MUSIC SCENE. THE TWO SISTERS ARE RESPONSIBLE FOR SOME OF THE MOST INFLUENTIAL SONGS OF EVERY MILLENIAL'S CHILDHOOD. FROM HITS LIKE "POTENTIAL BREAKUP SONG" TO "LIKE WHOA," ALY AND AJ HAVE CEMENTED THEIR PLACE AS POP STARS OF THE PAST, MAKING THEIR NEW TOUR AND COMEBACK A CHILDHOOD DREAM COME TRUE. On Thursday, June 28th, Blended Magazine attended the Boston stop on the Promises Tour, which consisted of Pride flags and a single cupcake to celebrate the 11th birthday of "Potential Breakup Song" (released on June 26, 2007). The crowd helped Aly and AJ blow out the candle on the cupcake to commemorate the birth of such an iconic song. Afterwards, everyone in the crowd screamed at the top of their lungs to two other Aly and AJ classics -- "Rush" and "Chemicals React." Their appearances on stage stood out the most, though. It was as if they were modeling for a major fashion shoot -- their casual, yet fashionable denim and plaid outfits felt like a good mix of night club meets New York Fashion Week. The concert was "like a rollercoaster ride" of emotions making everyone feel nostalgic, ecstatic, and sad at the same time. Seeing Aly and AJ on an intimate and small stage made everyone step back into their childhoods and truly enjoy the performance by both reveling in their youth while celebrating the sisters' growth. Ten years of waiting was worth it. With their pride anthem, "Good Love," which they brought out three pride flags on stage to perform with, the whole crowd felt their love and support for the LGBTQ community. 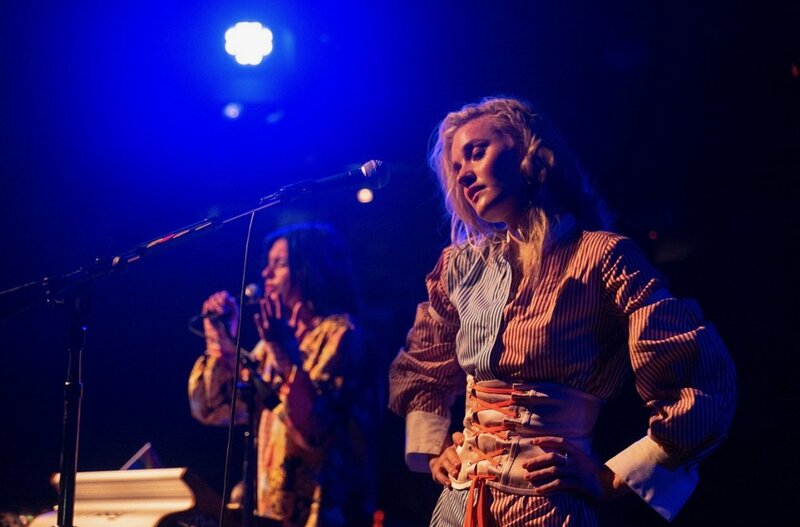 This tour shows how Aly and AJ have evolved since their last musical aspiration. Their music back then was much more pop infused -- the type of simple music devoted to car rides with the windows down. Today, their music is much more mature with a spectrum of many emotions. Even so, the sound comes across slightly mellow and a little less bubblegum. If anything, Aly and AJ have introduced more rock into their music since Insomniatic, their last studio album. Along with their tour, of course, came a new EP appropriately titled, Ten Years, which sounds even better live with Aly on piano and AJ on guitar. The new EP has an 80's vibe that channels popular artists such as Haim, Chvrches, and Carly Rae Jepsen, while also having that little sound of Genesis. One stand-out song is "Take Me," which is a track that feels like you could meditate to, but then slams right into an anthemic chorus. Overall, the tour gives us what we have been waiting for ten years. Aly and AJ delivered the same thrilling performance filled with nostalgic hits and seeing this concert will make you question whether it's 2018 or if it's the early 2000's. Still, there seems to be a hint of the future from the clear joy both Aly and AJ showed during the concert. Even though their tour ends July 6th in Chicago, IL, they have said that they will be back for a 2019 tour and hopefully, more music.